Fashions for men took a unique turn recently and we saw shoulder pads largely disappearing from new sport coats, suit coats, overcoats and jackets. This trend was avidly picked up across leading designer collections. The perception has been that these less padded styles are more versatile, more natural and organic in every way. The truth is that there are 4 primary jacket shoulder pad styles for bespoke tailoring. 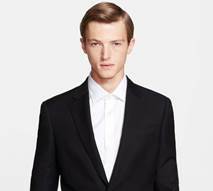 The shoulder pad effectively contributes to defining just how formal the style will be. 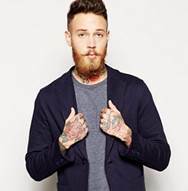 The recent trend reflects the growing less formal nature of men’s attire. This style is most easily adopted by persons with strong shoulders to begin with. The lightly padded shoulders of business suits are not as extremely casual, but we are seeing a trend toward less padding, perhaps as offices become more and more casual. The minimal padding helps give the jacket shoulder pad more structure and of course it looks a bit more formal. For those projecting a more professional image, this is the ideal choice. This works well for the existing executive or the aspiring one. It suits the visiting salesman who still needs to project an image of professionalism. If you are going to a fine restaurant for lunch with a prospect, then this jacket is much more appropriate. That’s why this particular jacket is part of the Armani Collezioni. That design works more smoothly to portray the strength and attention to quality that shoulder pads were originally meant to represent. The roped shoulder is likewise padded, but it has a sleeve head (top) that goes up above the shoulder line. 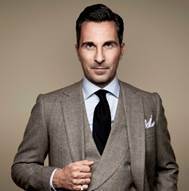 A roped style is quite Italian as styles go and so it works most effectively with European cut suits as opposed to American cut suits. Some designers go so far as to call this the Neapolitan style of shoulder. Tiny shoulder pleats accent this shoulder design even further.